The "Koelner Werkschulen" in Cologne became an Academy in the 1920s. Excellent craftmanship and appropriate materials were emphasised and a close relationship between design and realisation became most important. It was Professor Ferdinand Nigg (1865-1949) who founded the vestment classes in this Academy and it was also him to take credit for the importance of vestments in the german "Werkbund". Works of his students are today still preserved in many churches of the Gernan Rheinland. Erika Freund was Nigg's most important student. Unfortunately her creative personality today is almost forgotten. Only scarce dates of her life are known. So her birthdate is unknown and nothing has passed down to us about her family. In 1916 she started her formation at the "Koelner Werkschulen", with studies of book illustration and graphic art. At first she published two childeren's books. In 1921 she had a first commission for an embroiderd Baldachin, in 1927 she embroidered the green vestment for the Cathedral of Cologne. After finishing her studies she had a joint workshop with Ada Boese (1887-1975). In 1932 she participated in the world exhibition in Chicago USA. 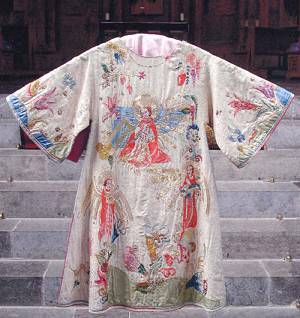 In the same year she embroidered the vestment for St. Gereon in Cologne. In 1943 she died after an operation. Works of the textile Artist Erika Freund have been exhibited for the first time from 4 until 18 September 2005 in the Basilica of St. Gereon in Cologne. 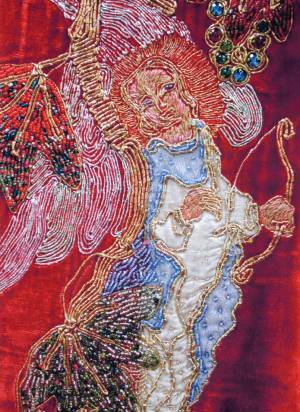 These embroideries are even finer than the vestment in the treasury of the Cathedral of Cologne. Erika Freund without any doubt belongs to the most outstanding textile artists of the early 20th century. In St. Gereon a unique series of her work is preserved and in the exhibition it was to be seen for the first time in all its richness. The catalogue shows for the first time as well the complete works of this personality, which is most important for modern vestments.